What the world is saying about Putin's re-election - Integration Through Media ....! MOSCOW, (AFP): China was the first world power to react Monday to Russian strongman Vladimir Putin’s re-election, vowing to push ties to a “higher level”, but Germany questioned the fairness of the vote and warned that Moscow would remain “difficult”. “Currently, the China-Russia comprehensive strategic cooperative partnership is at the best level in history, which sets an example for building a new type of international relations,” Xi said in a message to Putin. However, the European Union said “violations and shortcomings” in the election flouted international standards, pointing to one-sided media coverage and curbs on political freedoms. “We expect Russia to address the violations and shortcomings,” an EU statement said. German Chancellor Angela Merkel was to congratulate Putin, but the message will also raise “challenges” in their relations, her spokesman said. Berlin and Moscow have “differences in opinion” on issues ranging from Russian politics to the conflicts in Ukraine and Syria. 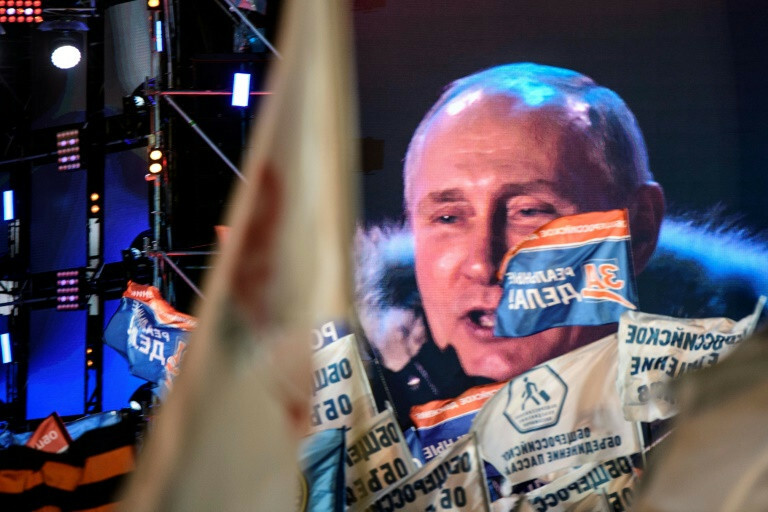 It was “unacceptable” that the election also took place in Crimea, which Russia annexed from Ukraine four years ago in breach of international law, Maas said. Poland also took up the Crimea theme with the foreign ministry saying the vote on the peninsula was “illegal” and urged respect for Ukrainian territorial integrity. In a phone call with Putin, French President Emmanuel Macron wished him “success for the political, democratic, economic and social modernisation” of Russia. But he also urged Putin to shed light on the ‘unacceptable’ double agent poisoning and express concern over the war in Syria. Hungary’s Prime Minister Viktor Orban led the applause from some friendly former Soviet-bloc states with a letter of congratulations. Bulgarian President Rumen Radev said he looked forward to working with Putin. The pro-Russian Czech Republic President Milos went further saying he looked forward to hosting Putin in Prague. Turkey’s President Recep Tayyip Erdogan, who over has cultivated closer cooperation with Putin, especially on Syria, congratulated the Russian leader by telephone, state media said. They also discussed a three-way summit on Syria due to be held with Iranian President Hassan Rouhani in Istanbul on April 4. Japanese Prime Minister Shinzo Abe congratulated Putin and the two leaders agreed to work together for North Korea’s denuclearisation, the Japanese foreign ministry said. “The two leaders confirmed their close cooperation in realising North Korea’s denuclearisation” before an expected summit between US President Donald Trump and North Korean leader Kim Jong Un, it said. “The Russian people’s exceptional trust in you is a natural outcome of your outstanding national performance,” Syrian President Bashar al-Assad told his close ally in a congratulatory cable. Iranian President Rouhani congratulated Putin on his “decisive victory” and pledged to boost ties. “I am sure that during your new term, relations between our two countries will develop further,” he said. Iran and Russia have strengthened ties, both giving major military and financial backing to Syrian President Bashar al-Assad. Egyptian President Abdel Fattah al-Sisi sent his “warmest congratulations”. “(Sisi) lauds the strategic relations that the two countries share and their keenness to further enhance them so as to realise the interests of both peoples,” a statement said. The presidents of leftist regimes in Venezuela and Bolivia congratulated Putin both using the same word, “overwhelming” to describe the victory. Russia and Venezuela are “brother countries” as both must “face the frequent manoeuvres of imperialism” to “impose doctrines of world supremacy,” said President Nicolas Maduro. Bolivian President Evo Morales said on Twitter that Putin’s win “guarantees geopolitical equilibrium and world peace before the onslaught of imperialism”. Saudi Arabia’s new strongman, Saudi Crown Prince Mohammed bin Salman and his father King Salman wished Putin “constant good health and happiness and his people steady progress and prosperity”.